This poem by Robert Louis Stevenson, of “Treasure Island” fame, seemed just right for this rainy day. On the topic of umbrellas, coworker Kim has requested an umbrella stand. For now, we’ve placed a bright red bucket by the front door. One of the things we are proud of here at CoWork 414 is our coworkers’ “Wish List.” These are items that coworkers would like to have. We try to add these to the cowork space. 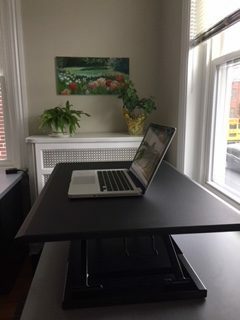 Ice cube trays was an easy one and so was the standing desk converter (pictured). New coworker Michele, who trains dental receptionists, wished for a large white board for the conference room. We talked it over and decided on the reusable whiteboard sheets, so they can be placed where Michele needs them. Other things on the list right now include a wall clock (I’m thinking analog, not digital, because a lot of people have enough of those, right?) and a bar-height table for the kitchen to go with the high stools in there. Actually, it was me who wished for the table, on a wintery day when the sun was shining into the kitchen. It seemed like such a good place to be on a chilly day. Lately, we’ve had just the opposite weather, but today is good to be inside, too, because of the rain. What is it about the sound of the water shirring off the cars that go by out front? The cheerfulness of a ceiling light and colorful paintings on the wall when the window shows a grey sky? The welcome of a well-lit hallway when you step inside the front door on a gloomy day?